There’s almost nothing more gratifying than straight up feasting on healthy food that you prepared with your own hands. I love to know what is actually in the food I’m eating (I’m giving the side eye to you, Monsanto), and I like to be able to pronounce all the ingredients. Admittedly, clean eating can be a challenge when you’re exhausted… on a weeknight… and super hungry… and just want to chill. I know the feeling. You guys, bad things happen when I’m too tired to cook. I gravitate toward bad-for-you quick fixes that are overprocessed, full of empty calories, and totally lacking nutritional value. I’m left feeling weighed down and even more tired. This recipe though! This is my go-to, weeknight, clean-eating, lazy girl recipe. I really try to stick to clean foods. 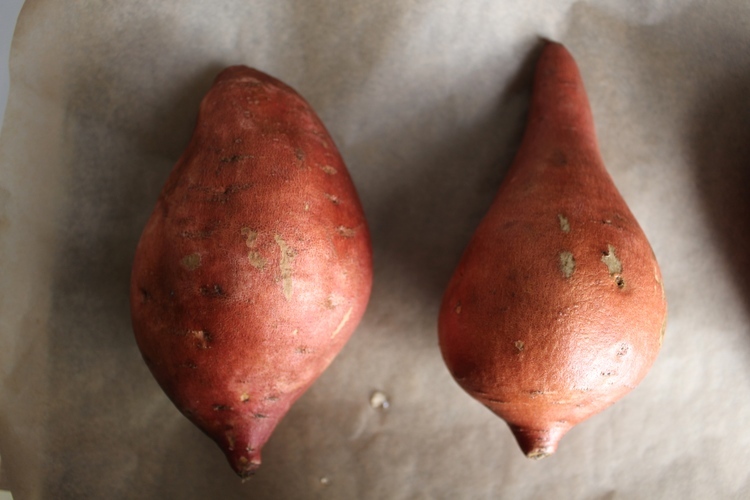 Foods that are delicious in their natural state and don’t need a ton of barbecue sauce to make them edible. Most of all, I try to stick to foods that give you more bang for your buck. Those foods that fill you up and keep you satiated, all for a reasonable price. 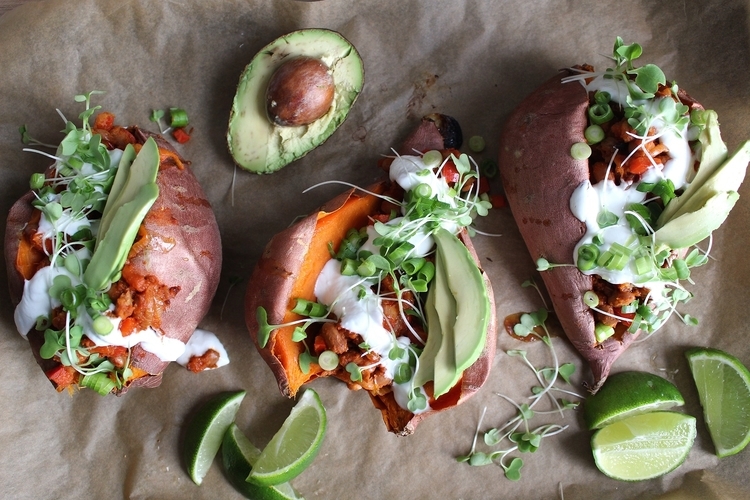 How can we go wrong with sweet potatoes, avocados, and beans? For real, these ingredients practically scream fiesta without the guilt and certainly without the huge price tag. Clean-eating ingredients, seriously filling at a low cost, quick cook time, and gourmet style presentation are really our #squadgoals here, y’all. This recipe certainly ticks all of those boxes. You must try this!!! Preheat oven to 400 degrees. Pierce each potato a few times with a fork. Place on a parchment paper-lined sheet pan, and roast for 60-75 minutes or until you can easily pierce the skin with a knife and the inside is soft. Allow to cool slightly before slicing and stuffing. While the potatoes cook, warm the coconut oil in a medium sized sauté pan or dutch oven. Add the onions and garlic and cook until caramelized, about 10 to 15 minutes. Add 1 tbsp water to the pan and scrape any brown bits stuck to the bottom in order to deglaze. Stir in spices and tomato paste and toast for 30 seconds. Add the bell pepper and cook for an additional 3 minutes. Once softened, stir in the beans, add a pinch of salt, and allow the flavors to meld together for 5 minutes. Slice each potato down the center, almost through to the bottom. Open to reveal the orange flesh. Spoon in the beans and top with selected garnishes. For the lime cream, simply whisk together lime juice and yogurt. Add water, a tsp at a time to thin, if desired. 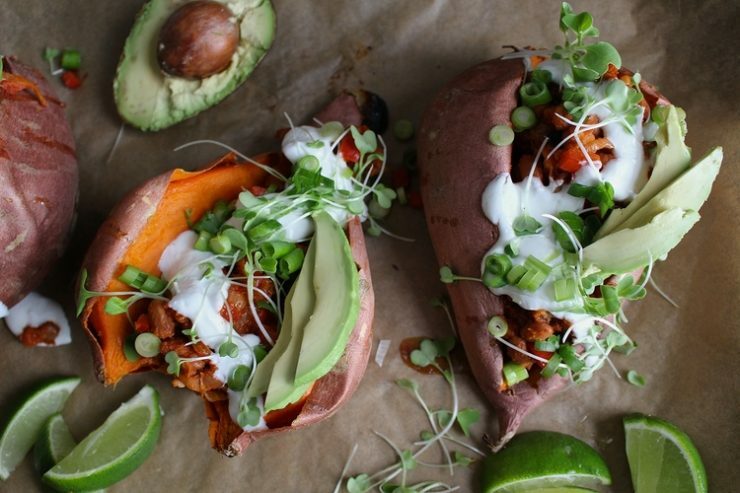 This almost makes me want to skip to fall for sweet potato season to be back…yum! Yay! Fortunately, you don’t have to wait. 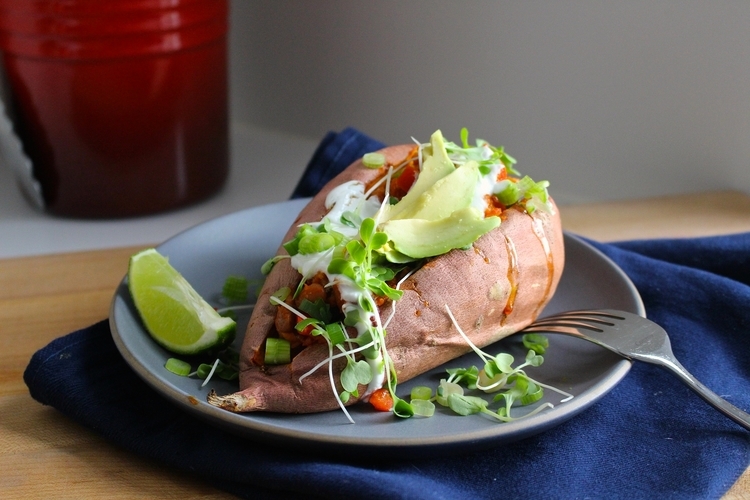 Who knew sweet potatoes could work so well as a Spring/Summer treat?! This is a great recipe to add to a Cinco de Mayo celebration. You won’t be disappointed! This looks like something we’d enjoy around here and I love love the lime cream! Sounds refreshing! Thanks, Jasmine! The lime cream is pretty delicious. I just used some on nachos!